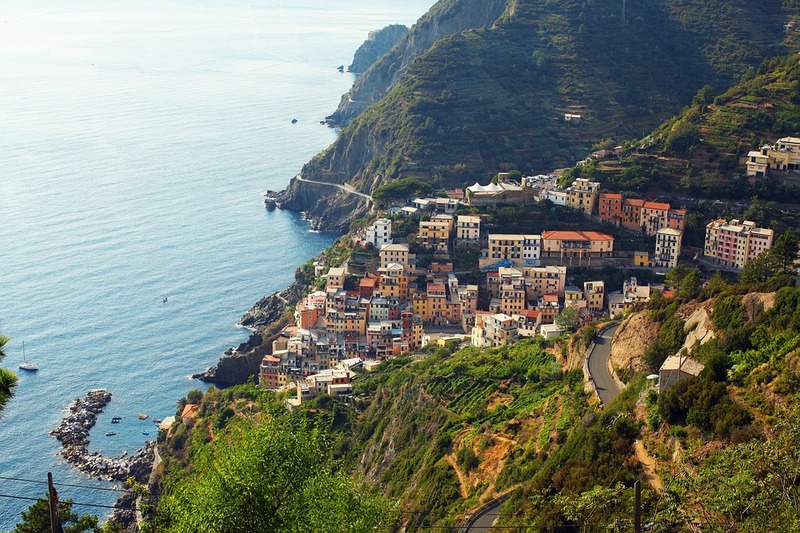 Crystal clear water, beach as far as the eye can see, hot temperatures, thousands of years of history, and of course good food: we’re talking about the Mediterranean way of life, specifically what the people there eat, and how it has inspired people all over the world to incorporate the Mediterranean diet into their lives. So what do you think? As a former visitor of the Mediterranean myself, I can’t help but remember the abundance of fresh vegetables and fruits, flavorful herbs and olive oil, seafood and tons of street food like gyros and spinach pies. Inspired by the nutrition and way of life in ocean side Greece and Italy, the Mediterranean diet is a hot topic in many parts of the world lately. Here, we’ll look into what the diet is, if it’s good for your body, and how it encompasses more than just the food you eat. 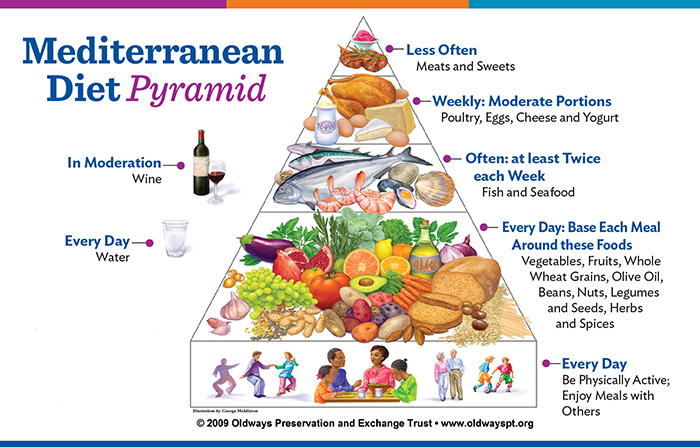 As shown below, the Mediterranean diet is separated into a pyramid of food options including a time frame of how often each food group should be consumed. Overall, it promotes eating plenty of plant fruits, vegetables and whole grains, occasionally eating meats and poultry, and substituting salt and butter with herbs and olive oil. The Mediterranean Diet is focused on fresh produce, lean protein and healthy fats. 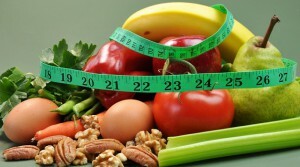 Every Day: The diet is centered on fresh fruits and vegetables, whole grains, beans and legumes. It also encourages nuts, seeds and olive oil and an abundance of spices and herbs. Plenty of water is also essential. About Twice a Week: Fish and other seafood should be eaten a few times a week. Weekly: about once a week poultry, eggs, cheese, yogurt and other dairy products should be consumed. Once in a While: Red meat, sugary sweets and red wine can be consumed on occasion, however they should not be part of the regular intake. You’ll also notice a category at the bottom of the pyramid that includes staying physically active, and making sure to spend time with friends and family. It mentions including loved ones during meal time. This is something that will guide dieters to keep a balanced mentality while watching what they eat. It takes into consideration complete physical health (diet and exercise) while including social and potentially mental health as well. 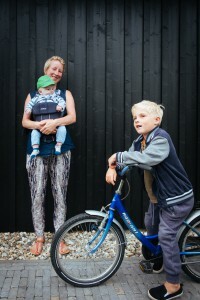 and family is part of the Mediterranean lifestyle. There have actually been quite a few studies done examining the health effects of being on the Mediterranean diet, and they have all found nothing but good. The PREDIMED study was a trial in Spain with over 7,000 participants who were followed for about 5 years. 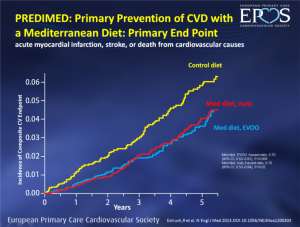 Groups that were on the Mediterranean diet supplemented with either olive oil or nuts had a much lower risk of cardiovascular disease compared to those who followed a standard low fat diet. Also, those on the Mediterranean diet had half the drop-out rate of the study compared to the control. This shows people are more likely to stay with this way of eating than a typical diet! diet can prevent heart disease. This study also considered this primary prevention of heart disease. That is, preventing the onset of a disease instead of treating it later when it becomes a problem. It saves money, time, and most importantly, quality of life. The same study mentioned above (PREDIMED), found that the Mediterranean diet can decrease the risk of Type 2 Diabetes by 30%. Other studies have shown that patients who already had diabetes could improve their average blood sugar levels. This could be a result because of the whole grains (healthy carbs) and substituted healthy oils into the diet. What’s So Great About Olive Oil Anyway? Why is olive oil so heavily emphasized in the Mediterranean diet? If you’ve ever had it freshly pressed from the tree you would understand how rich and delicious it tastes, which may be a big part of the draw of the Mediterranean people to olive oil! It turns out though, that is has much more benefit for our bodies than just great taste! Olive oil is a monounsaturated fat which has many health benefits like improving heart health and reducing the amount of bad cholesterol in your body. It also contains Omega 3 fatty acids, which are only found in a few foods and is considered an essential fat. Our body can’t make Omega 3 on its own so it needs to come from dietary sources. 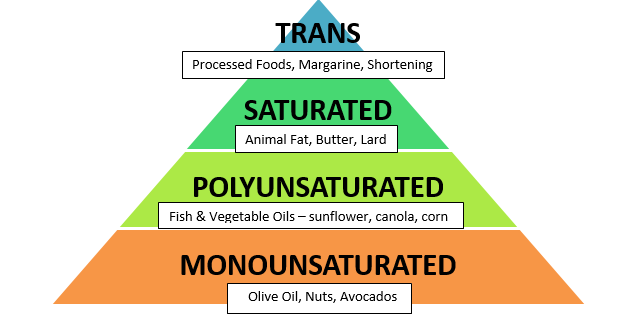 This is a huge difference from saturated fat and trans fat which are both generally detrimental to health. like olive oil and avoid trans and saturated fats. “Limited and not conclusive scientific evidence suggests that eating about 2 tablespoons (23 grams) of olive oil daily may reduce the risk of coronary heart disease due to the monounsaturated fat in olive oil” (source). With combined diet changes and increased exercise, weight loss is common for dieters on the Mediterranean diet. This is because it is done in a healthy, balanced way. There are many ways to lose weight, but to lose weight while maintaining good health and taking into account long-term affects is a balance. Healthy weight loss is a balance. The Mediterranean diet doesn’t cut back on the recommended ratio of carbohydrates and this is a good thing! This means the dieter will be able to lose the weight, and avoid the problems that come with lack of carbohydrates (read more in our “The Diet Guide: Paleo” article). In shorter terms, someone can lose weight on the Mediterranean diet without conflicting side effects. This could be why less people dropped out of the study mentioned above. If someone can feel good while losing weight, they are more likely to stick with a program. 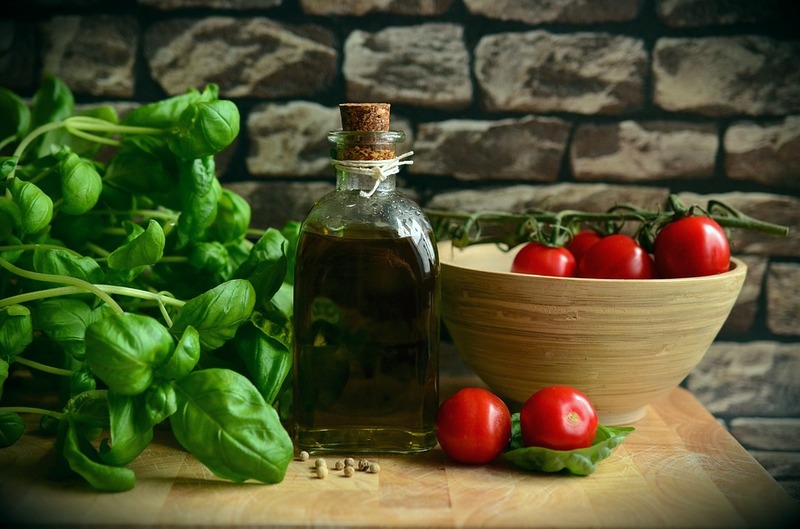 While I don’t believe there are many flaws to the Mediterranean diet, there are a few things to be cautious about while starting this new lifestyle change. 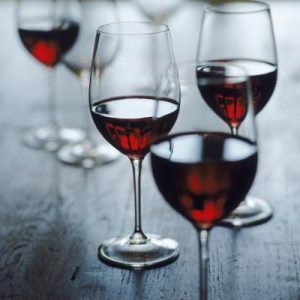 The Wine: While red wine has many antioxidants, there are many other food sources (like berries, chocolate and grapes) where we can get these without the drawbacks that comes with drinking alcohol. The diet also warns that if you or your family members have a history or alcoholism, you should probably skip the wine. where we can get them. The REAL Mediterranean Diet: It’s easy to think of the Mediterranean diet as anything you would find in any restaurant in Italy, or one of the many food carts in Greece. While these main dishes contain some of the food promoted in the diet, and are of course delicious, many times they don’t line up exactly with the structure of the Mediterranean diet. Street food can have a lot of added trans and saturated fat. Make sure to stick to the pyramid above. Have fun and add lots of flavor from herbs to your dishes! In our society it can be easy to get caught up in a diet for a specific goal; usually weight loss. Through a variety of foods, no calorie counting, physical activity and social interactions with friends and family, the Mediterranean diet provides a lifestyle pattern to start while improving many areas of your life. What are your thoughts? Will you try the Mediterranean diet?